Yes if you read enough reviews, you’ll hear a lot about the abundance of cyclists who visit this café especially on the weekends so I was prepared for a chaotic crush. However despite the close proximity to Centennial Park and any number of bicycle shops, the throngs had disappeared by the time 10AM rolled around and all was peaceful. Apparently, the adjoining walls of Parc Café and the two other cafés of this four-way intersection were completely lined with bicycles a few hours earlier! The waitstaff were reasonably fast this morning and I appreciated at least being told that there was a reason for the slight delay… *du du duuunnn* a new chef! It’s fair to say that I was nervous but it’s no surprise to you, dear Reader (thanks to the score above) that the morning went without a hitch. Clean skins coffee supplied by Andrew Gross (Coffee Masters of Alexandra) who my guest and I had the privilege of sitting next to and chatting with this morning. 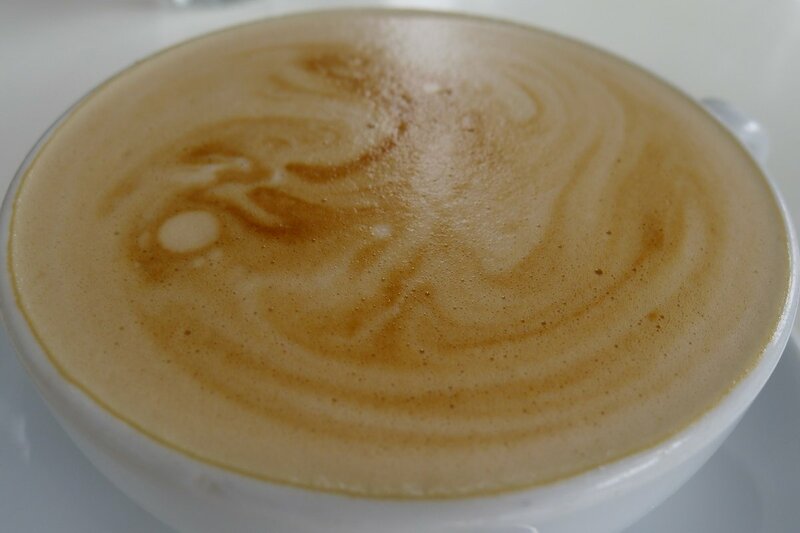 The cappuccino especially was well-presented and both of our coffees ($4) were delicious. Certainly not as strong as other cups I have tried recently but I would certainly return if I was in search of caffeine in the area! I had heard that the potato cakes ($22) are a must-try if I ever visited Park Café. Well now I’ve tried them and I can tell you that they are a must-try! The potato cakes are served with salmon however my guest asked for bacon instead and the kitchen was happy to oblige. I’m sure that the salmon works well too but this dish combined with the bacon was a perfect marriage. The cakes are comprised of thin strips of mashed potato, red onion, herbs and enough seasoning. 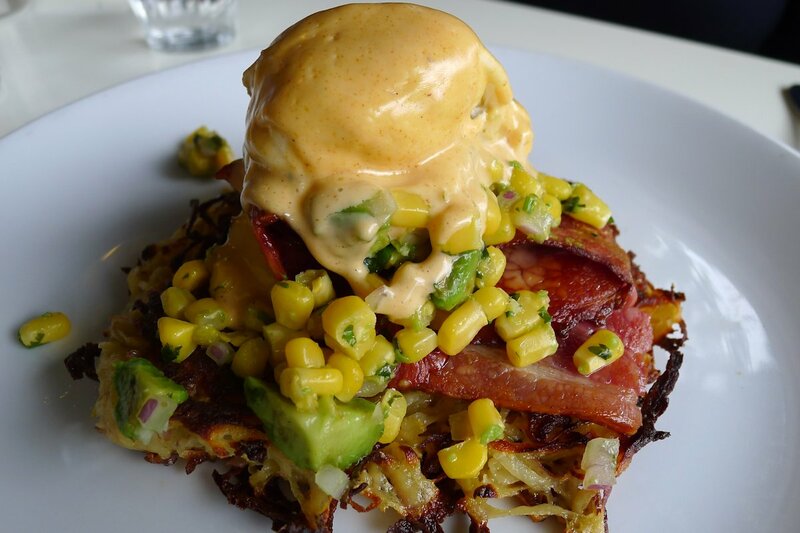 The layers above are just as good: fresh avocado, corn, stacks of bacon and a paprika aioli that mixes well with all other components. 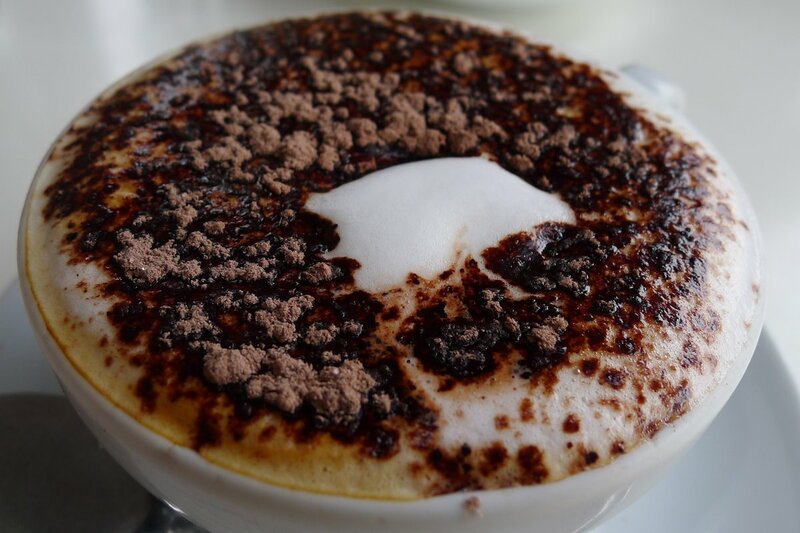 This would be a great winter warmer! 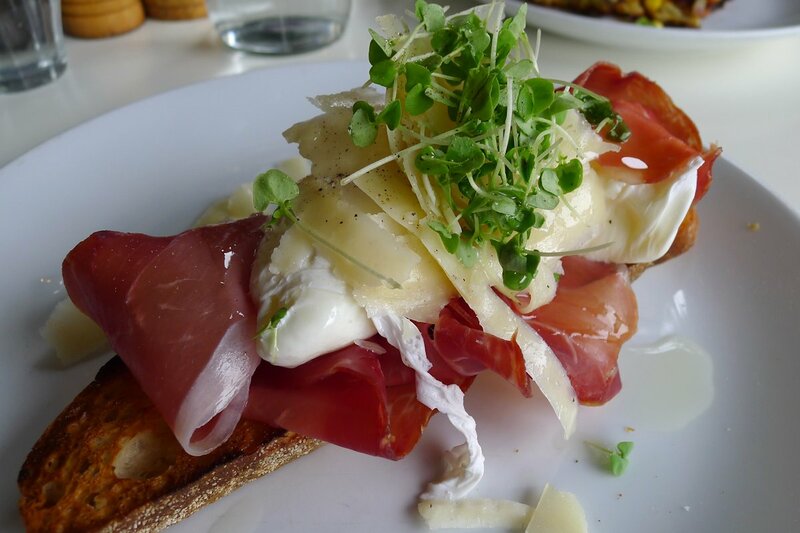 Equally as impressive was the prosciutto, poached egg and shaved pecorino ($18). The prosciutto was a stand-out; thin, succulent and very tender. It blended perfectly with the bite of the pecorino and the light drizzling of white truffle oil over the top. 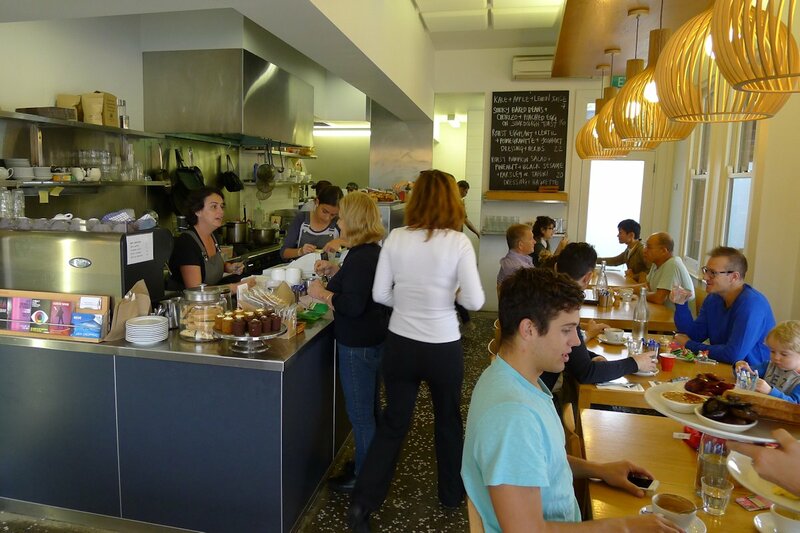 Other dishes available include bircher muesli with poached plum & pistachio (regular $10, large $14), buttermilk pancakes with raspberries & marscapone ($17), smashed avocado, feta, shaved radish, black sesame and sourdough ($16) or trout gravalax, ricotta, caper & parsley salad and sourdough ($18). 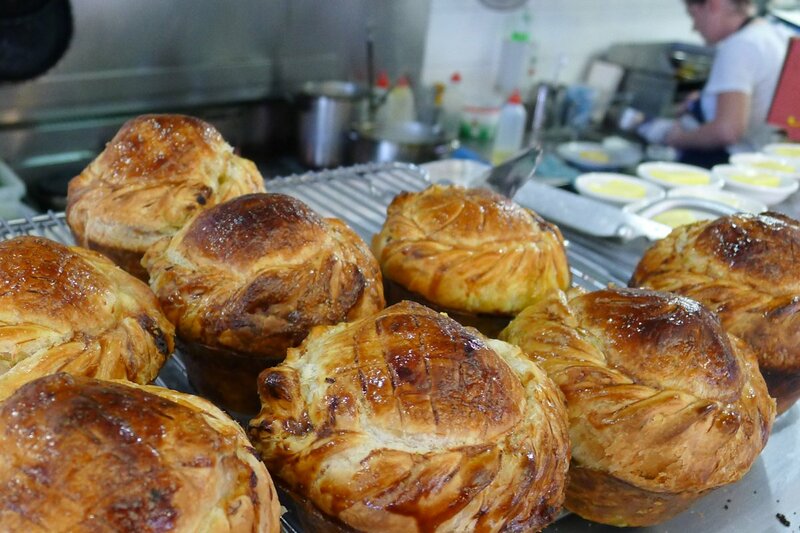 Pies ($15) available offer fillings such as braised beef, pea & feta or chicken & leek. Each are served with a different salad. I took one of the chicken pies home and was hugely impressed by the pastry and amount of chicken in the filling. You will enjoy this as an eat-in dish or a snack. Sauces, dressings and jams are also available to purchase. An accomplished, well thought-out menu with high quality ingredients is the star at Parc Café. While the prices are more than I would usually expect, we thoroughly enjoyed our dishes and the peaceful outside or vibrant interior ensure that there’s a table to suit your mood. All in all it’s a successful formula and I definitely recommend a visit. 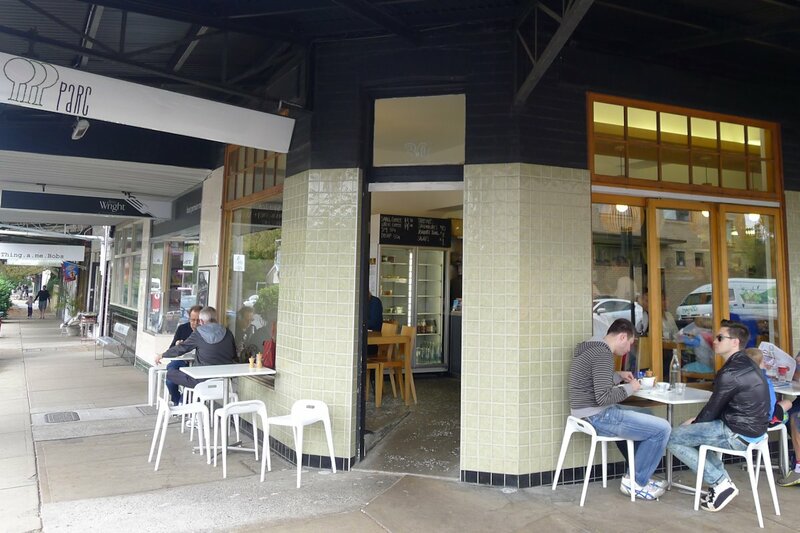 This entry was posted in Sydney - Eastern Suburbs, Sydney - South and tagged Disabled access, Dog friendly, Free range eggs, Gluten free options, Outdoor seating, Parking close by. Bookmark the permalink.